At GIW Industries (a KSB company), we are not only a slurry pump manufacturer; we are also in the transportation business. We can move just about any material you specify, both quickly and efficiently. Our slurry pumps have been used to pump phosphate rock in Florida to copper ore in Australia and hundreds of different materials in between - everywhere in the world. As a subsidiary of global pump and valve manufacturer, KSB AG of Germany, we have the infrastructure to supply worldwide and 125 years' experience in pumps and hydraulics. This makes KSC your mining and minerals processing pumping solution. KSB is well known for producing reliable and long-lasting slurry pumps. By listening to its customers, KSB continually strives to create new products and services to provide just what its customers need: rugged cost-effective pumps and services that extend pump life. One of GIW's newest pump series is its Mill Duty Xtra Heavy (MDX) slurry pumps. 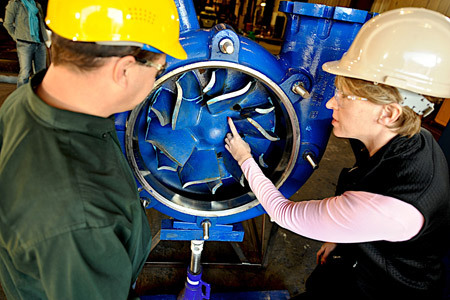 At the heart of your facility, mill pumps can reduce operating costs when pump operating cycle times match scheduled mill outages. The MDX series pumps are specifically designed for the hard rock mining industry - meaning fewer production disruptions and increased operational efficiency. The company's high volume froth (HVF) pump is designed to work with slurry processesthat use froth to help separate materials during processing - the HVF is applicable in a wide variety of mining and processing industries, from oil sands and hard rock to phosphate plants. Use remanufactured units to establish an exchange program to meet specific customer needs. GIW pump wear parts are designed to last and GIW's Gasite®, white-iron alloy, ensures their life-span is increased even further. Gasite material is a result of many years of refinement in our metallurgical laboratory to improve and enhance the properties of white-iron alloys for our pumps. The result is a family of alloys that offer superior erosion and corrosion resistance for most slurry applications. For severe applications where downtime is critical and production is crucial, GIW offers our new premium materials Endurasite™ and Enduraclad™. GIW has developed these unique premium alloys through extensive laboratory research and field trials. Endurasite™ is a white iron alloy with a special materials mix that is put through a complex process, giving it unique properties. Field trials of Endurasite™ have shown up to double the life on certain wear parts. Enduraclad™ material is applied to the exterior wear surface of GIW's Gasite® or Endurasite™ white iron alloys, where it forms an integral bond through a special process. This creates an extraordinarily hard and wear-resistant surface that delivers a wear life up to three times longer than normal materials. At GIW, wear life and efficiency are the most important features in the design of slurry pumps. GIW leads the world in wear life technology with over 40 technical papers and over 30 years of research. We collaborate with you to design solutions to improve your business. Metallurgical test laboratory: where proprietary materials are developed. Using state-of-the-art tools, predictive corrosion and erosion tests are performed to ensure the appropriate materials are used for each application. GIW’s proprietary pump selection tool SLYSEL utilizes real performance data gathered in our testing facilities to provide the correct pump selection for every application. Slysel can also be used for pipeline design and system troubleshooting tapping into decades of experience in slurry application and hydraulic design.GIW’s technical expertise is showcased through the GIW Technical Training Series. Several courses are offered throughout the year including the Transportation of Solids Using Centrifugal Pumps, now in its 35th year and the GIW’s Maintenance Course. GIW technical training allows our customers to stay on the cutting edge technologically.